Homemade hummus, if you please! Hello friends! I’ve missed you! You know how life gets in the way when you are planning things? Well, yes, that’s what happened to me over these past few months. It’s been forever since my last post and I truly apologize. I hadn’t been feeling well and it turns out that I have thyroid issues. And it all makes sense to me now! Health aside, my blogging partner, Daria, has started a new career teaching pastry arts full time and we are overjoyed for her! In addition, she launched her gluten-free baking business Batter. A Gluten Free Baking Co, LLC, and she’s been super busy selling her delightful gluten free goodies every Saturday in Hershey at the Farmers’ Market on Chocolate. Her dad and I are in awe of her talent and stamina! So today, I am going to keep it simple, okay? My diet has gone almost 100% organic and luckily for me, Daria, has an organic veggie garden. Every time I see her she fills my arms and cooler with lots of wonderful veggies that help me cope with my aches and pains….she’s a great kid! Since my refrigerator has housed 2 eggplants for a few days, I decided to make an eggplant hummus. I looked for a recipe that could guide me and I found one at epicurious.com. I looked it over and checked my pantry ingredients and I had everything except the chickpeas! No problem….I had cannellini beans….it can be Italian eggplant hummus, right? So I modified the recipe to fit my needs, as most people do, too! It’s fun to make things your own! Cut eggplants in half lengthwise. 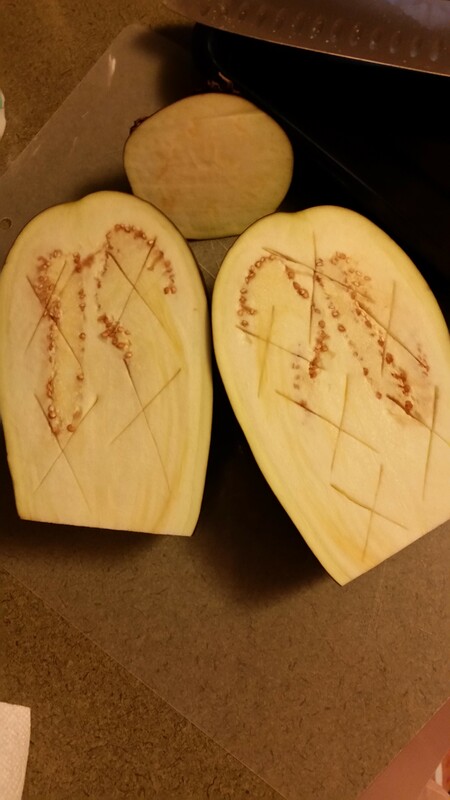 Make a crisscross pattern with a sharp knife, here and there, on the flesh. Rub each cut side with a total of 1 1/2 tablespoons oil; sprinkle with salt. Place eggplant on rimmed baking sheet, cut side down; bake until tender, about 1 hour. 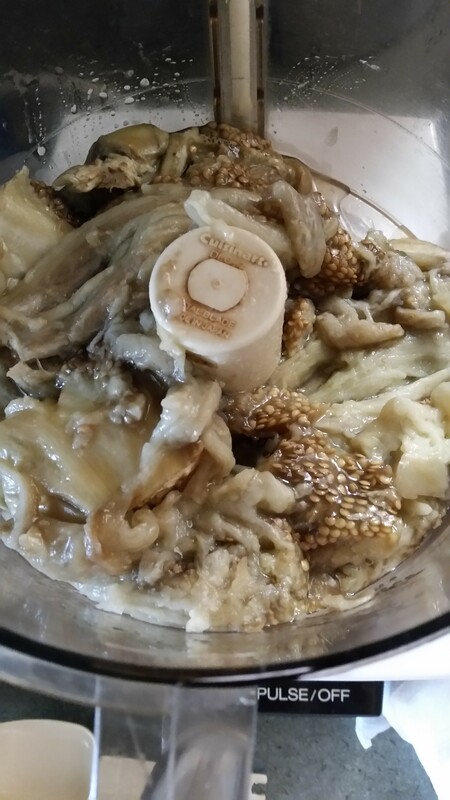 Cool and then scoop flesh (seeds and all) into food processor and discard eggplant skins. 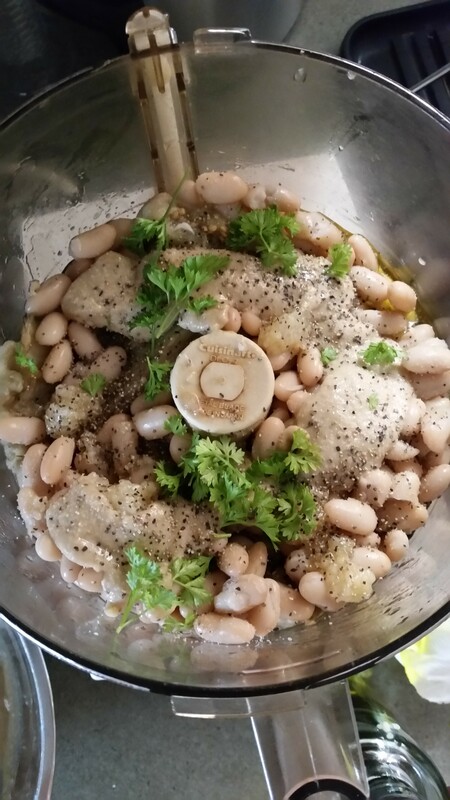 Add cannellini beans, remaining 1 1/2 tablespoons oil, lemon juice, tahini, fresh parsley and garlic; puree until mixture is almost smooth. Transfer to bowl; swirl some additional olive oil on top before serving and add extra parsley if desired. Taste and season the hummus with additional salt and pepper if desired. 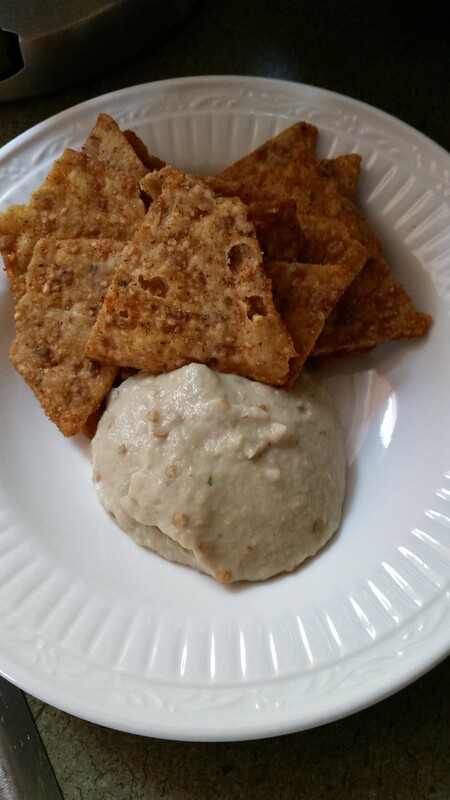 You can serve the hummus in individual bowls with Lundberg Gluten Free Rice Chips, as pictured here!